Once known mainly for its small cars, Kia now has a full range of models. The current lineup includes two premium sedans: the front-wheel-drive Cadenza and a bigger, more costly rear-drive K900. Initially launched as a 2010 model, the Cadenza was redesigned as a second-generation sedan for 2017. Little has changed for the 2018 model year, except that the optional V6 Luxury Package now includes a panoramic sunroof and interior LED lighting. Three trim levels are offered: Premium, Technology, and Limited (previously SXL). Each Cadenza contains a 3.3-liter V6 engine rated at 290 horsepower and 253 pound-feet of torque, driving an 8-speed automatic transmission. With the original Cadenza, Kia didn’t simply prepare a bigger version of its other sedans. On the other hand, the company’s largest front-drive sedan didn’t veer far away from the mainstream. Styling is best described as evolutionary rather than groundbreaking, and fuel economy hasn’t been a strong point. Still, the Cadenza has matured considerably in its current, second-generation form. 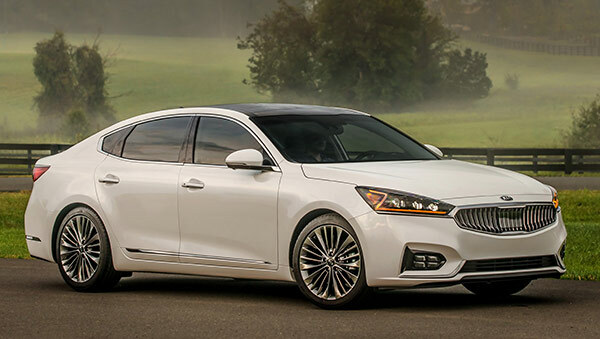 Although a Cadenza lacks some of the luxurious touches offered in Kia’s rear-drive K900 and its compatriots, it offers plenty for a more accessible price. Even the base Premium trim level is quite well-equipped, including leather seat upholstery and a rearview camera. A $3,000 option group for Premium trim includes navigation, an 8.0-inch touchscreen, panoramic moonroof, blind-spot monitoring with rear cross-traffic alert, lane-change assist, rear parking sensors, and 630-watt Harman Kardon audio. As for modern safety technology, forward-collision warnings and automatic emergency braking are standard on the more costly Technology and Limited trim levels. Neither is available for the base (Premium) sedan, though the latter can be fitted with blind-spot monitoring. A rearview camera is standard for all; while a surround-view camera system comes with the Limited edition. Crash-test data is incomplete. The National Highway Traffic Safety Administration has not crash-tested a Cadenza. The Insurance Institute for Highway Safety named the Cadenza a Top Safety Pick for 2018, with Good ratings in all crash tests. Frontal crash prevention is rated Superior, but only if certain optional equipment is installed. In addition, only the optional LED headlights were deemed Acceptable. Technology ($39,290) gets 19-inch wheels, ventilated front seats, wireless smartphone charging, bi-function LED headlights, adaptive cruise control, and forward-collision warning with automatic emergency braking. Limited ($44,690) adds Nappa quilted leather, sunshades, heated outboard rear seats, surround-view camera system, and a head-up display. Few might call the Cadenza daring or audacious, but the design is pleasant enough, and even a bit interesting. Such details as LED lighting and a mildly concave grille up front provide a dash of liveliness, as well as a sense of character. For a full-size four-door, the Cadenza neatly incorporates some styling cues that suggest a sport sedan. Most notably, this front-drive sedan veers emphatically away from the formal lines that identify the larger K900 model, which comes across as somewhat dowdy. Base-model (Premium) Cadenza sedans have their own grille, whereas the front ends of Technology and Limited editions convey a stronger appearance. Upper models get LED headlights and foglamps, and ride on distinct 19-inch wheels, versus 18-inch for the base sedan. All models feature LED positioning lights. With its wing-shaped dashboard layout, the Cadenza cabin has a familiar, rather predictable feel. Some might call it sedate, but the look is wholly modern. When trimmed in Nappa leather, though, it’s especially welcoming. The Limited sedan gets rather flashy stitching on its leather. Materials quality and detail work stand above the pack. Basic-level plastics are limited to lower door panels and trunk liners. Nothing about the interior suggests the thrifty overall feel of some Kia economy cars. Controls consist of actual knobs and buttons, grouped around the central touchscreen. They help make the Cadenza an easy car to operate. A considerable amount of sound-deadening materials ensures quiet cruising. Five adult passengers can fit inside without notable discomfort, helped by a large back seat. Headroom and shoulder space are just fine, though clearance for taller occupants might be affected by the panoramic sunroof. The long roofline helps provide abundant head space in the back seat, while legroom can seem almost limousine-like. Front seats are sufficiently supportive, without excessive firmness. Multiple seat adjustments are standard in all Cadenzas. Driver’s seats in Technology and Limited versions include a powered leg bolster that slides out, to give taller drivers better support. Kia’s simple infotainment system works nicely. Among the biggest in its class, the Cadenza’s trunk holds 16 cubic feet. Small-item storage is very good, in the console as well as door pockets. Cadenza riders can expect a quiet, even hushed, experience, with a powertrain that’s barely noticeable. Far from stiff, the ride supplied by Kia’s independent suspension is calm and relaxed. Ride and handling are effectively coordinated. Though the driver might feel somewhat isolated, road feel never gets sloppy in nature. Handling cannot be called crisp, but it’s well-composed, if a bit cushiony. Steering is somewhat heavy for a big car, but brakes respond well and are easily modulated. Body lean in corners is moderate, and body motions are well-controlled. While the Cadenza might resemble a sport sedan, performance doesn’t quite warrant that designation, though it reaches above average for the class. With its 8-speed automatic, the Cadenza responds promptly. Low-end vigor isn’t the strongest, but the sedan enters traffic flow without hesitation. Downshifts to pass or merge occur quickly. Comfort, Eco, Sport, and Smart modes may be selected, but differences are modest. Each mode alters steering and throttle response, but doesn’t affect the suspension, which is tuned for ride comfort. Despite the use of an 8-speed automatic, fuel economy ranks as so-so. The Cadenza is EPA-rated at 20/28 mpg City/Highway, or 23 mpg Combined. Kia earns plaudits for the Cadenza’s features and driving comfort, as well as ample standard equipment. Rivals may promise sharper handling, but quiet running and gentle ride qualities can give Cadenza the edge. So does the spacious cabin, with a back seat that almost qualifies as a benchmark in the full-size sedan category.